Parkinson’s Disease currently affects over 8,000 West Australians, with over 20,000 affected by having a family member living with Parkinson’s. The devastating effects of this disease are felt through out many different West Australian communities, and the WA jazz community is no different. 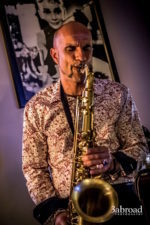 To help combat the disease and aid those afflicted by it, jazz musician and Treasurer for JAZZWA; Pete Jeavons, has assembled a great line-up of WA jazz groups to perform at this special fundraising event on Tuesday December 12th at The Ellington Jazz Club. 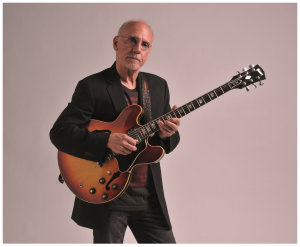 With traditional jazz from The Gumnut Stompers, neo-soul from songstress Shameem and acoustic modern jazz from Pete Jeavons own quintet, “Jazz Against Parkinson’s” features local groups from across the jazz spectrum, side by side, to raise money for Parkinson’s WA. For anyone who is not able to make it to this event, but would still like to contribute to the fundraising effort, there is an online fundraising campaign for Parkinson’s WA running concurrently through www.mycause.com.au/page/164577 where any donations would be gratefully received. TURA New Music is proud to present UK free jazz pianist, composer and innovator, Keith Tippett in Residence in his first ever visit to Australia. The Keith Tippett Residency is Tura’s first international Residency as part of their iMprov program. Over the course of the Residency, Tippett will collaborate, improvise, and perform with the Western Australian Youth Jazz Orchestra (WAYJO), members of Tura’s iMprov Program, and the especially formed Mujician Mosaic ensemble. The Residency will include two stand-alone concerts; the first, an up-close and personal solo sitting in Tippett’s rehearsal room. An intimate opportunity for lovers of contemporary jazz and improvisation to see Tippett at his freest at 7.30pm, 1 December, Rehearsal Rm 1, State Theatre Centre of WA. The Residency will then conclude with Mujician Mosaic, at 7.30pm, 7 December in Studio Underground, State Theatre Centre of WA. Mujician Mosiac will feature extended collaborations with WAYJO, Tura’s iMprov members, and the Mujician Mosaic ensemble. Now in it’s 15th year, the JazzNOW! 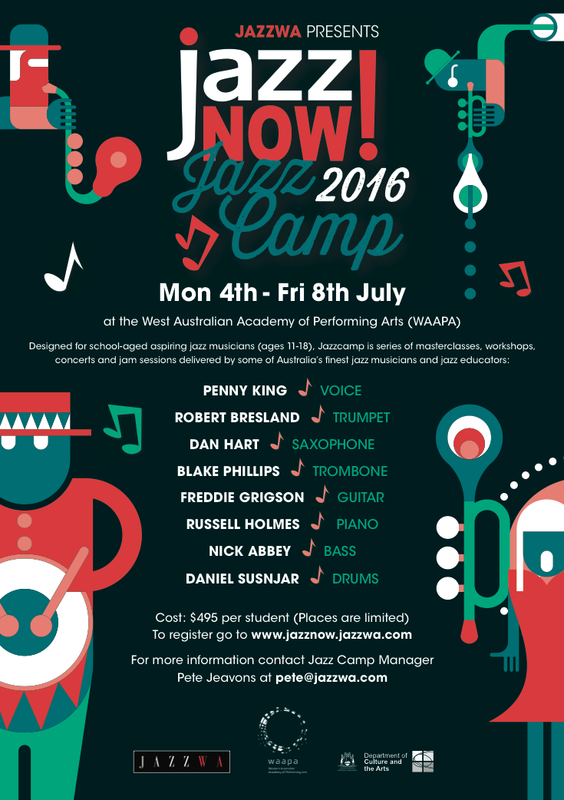 Jazzcamp is tailored towards students aged 11-18 and held at WAAPA annually in the first week of the July school holidays. 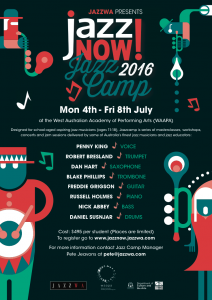 This years dates are Monday 4th – Friday 8th July, and the 2016 tutors are Penny King (voice), Robbie Bresland (trumpet), Blake Phillips (trombone/low brass), Dan Hart (saxophone/woodwinds), Freddie Grigson (guitar), Russell Holmes (piano), Daniel Susnjar (drums) and Nick Abbey (bass).